As I explored in my last post, I expected that the eighth-annual SIP and Cloud survey from The SIP School would show a decrease in provider problems, but that was not the case. I also thought that there would be a decrease in the number of PBX and SBC equipment problems -- also not so. The 2018 SIP and Cloud report includes input from 840 professionals. 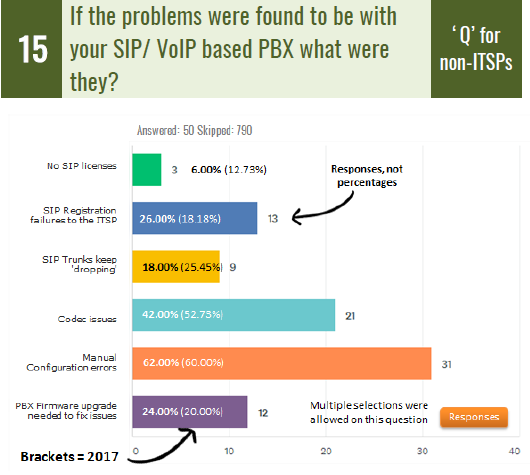 In my last blog, I covered that survey respondents reported the SIP trunk provider was responsible for 32.78% of problems experience -- an improvement over last year. 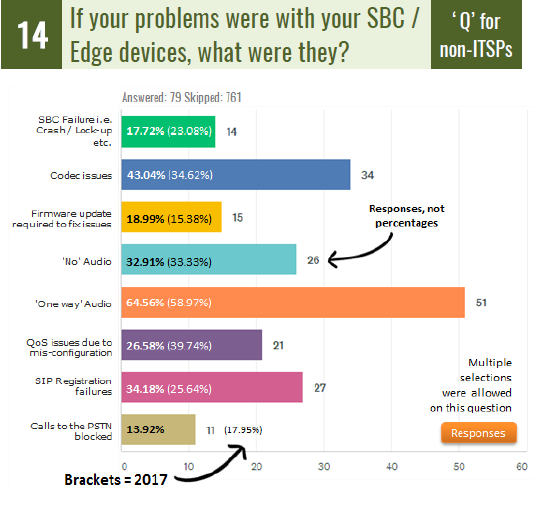 Respondents indicated that the SBC/edge device vendors were responsible for 23.72% of problems, which was an increase over last year, and that the PBX vendors were responsible for 15.62% of problems, which also was an increase over last year. Let’s take a closer look at the SIP equipment problems. The graphics in this blog are from The SIP School’s survey. A session border controller (SBC) is located between the enterprise PBX and the SIP trunk provider. Alternatively, the SBC function could be included as a cloud service or may be integrated software located in the PBX or a firewall. I have to wonder, do any of the equipment vendors read the survey and modify their products in response to issues reported in the survey? These device vendors faired more poorly in the 2018 survey than in the 2017 survey. It appears that the vendors are not learning from the issues being reported and instead, it’s the people doing the SIP trunk implementations that are being forced to solve the problems. It’s common for the customer to have some CPE configuration errors. This is due to the fact that every provider has a slightly different way of delivering SIP trunks and vendor application notes usually cover only the most basic configuration settings. The basic inbound and outbound calling functions can appear to work but a review of the SIP traces could show that signaling is not operating properly. This causes advanced functionality to fail and intermittent call failures. A detailed test plan that ensures both the customer and provider devices are operating per specification is highly recommended. Manual configuration errors cannot be fixed by any of the equipment. In other words, an SBC cannot compensate for improper configurations. The survey discovered that the portion of problems residing with the PBX increased from 14.05% in 2017 to 15.62% in 2018. It’s worth noting that in earlier surveys, PBX vendor problems had been decreasing. Configuration errors dominated the list of problems. Codec issues, followed by SIP registration problems, rounded out the top three problems reported. The worst participants are still the dealer/resellers. Is their poor showing due to training, experience, poor documentation, or negligence? It’s not usually the equipment vendors and providers, but more often the SIP trunk provider that has issues. In any case, many organizations work with a dealer/reseller, not directly with the provider. The organization would therefore turn to the reseller first when a problem surfaces. However, the dealer/reseller is least capable of providing problem resolution. This has been the case for the last several surveys. Is your network ready for SIP trunks? Did you perform an assessment with VLANs and layer 2 QoS configurations? Does the provider agree you are ready? There are many WAN assessment tools available. Test your existing WAN links and look for any potential issues such as link instability, router problems, and bandwidth issues. MPLS networks deliver QoS, but can be expensive. Alternatively, SD-WAN may reduce costs but should deliver an assured service. Investigate what the SD-WAN provider offers with regard to QoS assurances and SLAs. There are differences if you are using your own PBX (TDM or IP), a hybrid, or a VoIP-enabled one. Does it support SIP connectivity or will you need a gateway? If you need a gateway, it may have configuration errors. Your PBX vendor should be able to recommend solutions.